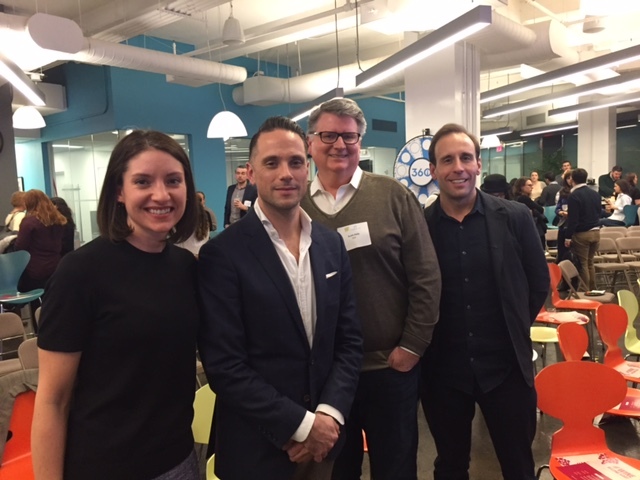 in Influencer Marketing, Social Media with tags #WineWednesday, Abbey Klaassen, Brian Sacawa, He Spoke Style, influencer marketing, Nick Guastaferro, Scott Daly, SMWNY, social media week, WOMMA Both comments and trackbacks are closed. As part of Social Media Week New York, 360i partnered with the Word of Mouth Marketing Association (WOMMA) for a #WineWednesday panel event, welcoming special guests Brian Sacawa, founding storyteller of He Spoke Style, and Nick Guastaferro, the Director of Marketing for Absolut Vodka at Pernod Ricard USA (client) for a candid panel discussion with our SVP, Integrated Media Practice Lead Scott Daly and CMO Abbey Klaassen on the importance of incorporating influencer content into existing media plans, and how brands and marketers can best leverage this authentic content. While tapping influencers to create content for brands is nothing new, those brands that are willing to champion the content by embracing it as their own – especially through media support – have seen great success. By allowing influencers to tell a brand’s story through a new lens, marketers can make their content work harder and unlock new audiences of advocates. The panel opened with a look into Absolut’s recent ‘Absolut Quality’ campaign story. With Absolut being best known for its ties to art, music and the nightlife scene, the brand was challenged with communicating the quality of its product in a way that wasn’t self-serving but authentic. Enter influencers, tasked to help tell the Absolut brand story in a way that would resonate with key audiences. Absolut teamed up with three storytellers – including panelist Brian Sacawa – and two renowned photographers with large, dedicated followings on Instagram to bring Absolut’s quality story to life through unique narratives and a photo series that showcased the artistry behind creating the premium vodka through the lens of unique craftmakers who helped tell Absolut’s story strategically across paid, owned, earned and shared platforms. Find the right partners to tell a brand’s story. From Nick’s perspective, the right partners for Absolut are those with a good sense of self, who create beautiful content and design, and those with the ability to take a complex message and break it down in a way that’s still engaging to the consumer. From an influencer’s perspective, while trying to build a reputable brand of their own, it’s equally important to be selective of brands with which to partner. With Absolut, Brian was instantly attracted to the brand’s voice and quality message, as it complimented his own editorial mission. Easier said than done for most brands, but as Nick addressed, once you have a solid brief and strong partners in place, it’s important to provide guardrails and step back to let storytellers do what they do best. The outcome may be different than envisioned initially, but will ultimately result in organic content that best resonates with the influencer’s audience and beyond. On the agency side, Scott knows that many marketers aren’t quite comfortable giving up creative control. He touched on how agencies must consider the campaign objectives to clearly communicate why clients should be taking this leap of faith. In the case of ‘Absolut Quality,’ authenticity was the key factor in the story so the team knew working with influencers would be the right move. Without an existing campaign or assets to build off, the campaign heavily relied on influencers to act as creative partners. As a collaborator, Brian took the brand’s message and made it his own. He knew what would appeal most to the audience he’s built and saw great opportunity to integrate his video series, collaborating with a bartender to bring the quality message to his audience. In a world of emerging platforms, don’t always write off the old tried and true. Brian has seen the influencer landscape change quite a bit since he launched his blog three years ago. More and more, social influencers are moving away from blogging and focusing on social platforms. In making influencer content work best for a brand, it’s important to factor in SEO strategy to allow the content to live on longer, which can’t be accomplished strictly through social shares. For brand partnerships, he believes the traditional blog format will regain popularity as storytellers like himself grow audiences that are engaged and want to learn. In the ‘Absolut Quality’ campaign, blog posts were amplified through paid social tactics and content seeding partners to maximize reach among new audiences, ultimately exceeding benchmarks.